Cartoon Network legends come together in a joyous animated romp. Cartoon Network has been up and running in the USA since 1992, but it took another year to arrive in Latin America, making 2018 the 25th anniversary of Cartoon Network Latin America. 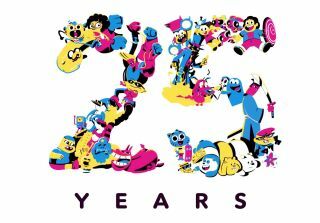 And to mark 25 years of entertaining kids (both young and old) and inspiring the next generation of animators, the ever-popular channel commissioned Buenos Aires studio Le Cube to create this 25th anniversary celebration film. Designed by Argentinian freelance illustrator Delfina Perez Adan, this wonderfully stylised short brings together a whole host of Cartoon Network favourites from the past quarter of a century, all of them rendered in an eye-catching CMYK palette. There are so many of them flashing before your eyes in quick succession that you're going to have your work cut out spotting them all. Naturally you'll notice Finn and Jake from Adventure Time – not to mention Ice King – and the eagle-eyed among you won't have failed to notice the likes of the Powerpuff Girls, Dexter and Dee-Dee, Johnny Bravo and Cow and Chicken. After a bit of frantic dashing around and the occasional scuffle, the characters all come together to form a suitably celebratory giant 25. The whole film lasts just over a minute, but there's so much action and so many details and characters to try and recognise that it rewards multiple viewings. For the team at Le Cube, it's been a joy to produce. "Cartoon Network has always been an inspiration for kids everywhere," they say. "So much so, that even many grown-ups who work in animation do it exactly because of how much they loved Cartoon’s creations when they were young. "That's why it was such a gigantic honour for us at Le Cube, after we too were not so long ago just kids sitting in front of the TV amazed by what we saw, to create the channel’s 25th-anniversary celebration film."